Hakim Warrick scored 20 points while Gerry McNamara added 16 points and Josh Pace 13. Hakim Warrick scored 26 points, while Gerry McNamara and Josh Pace added 15 and 10, respectively. Gerry McNamara scored a game-high 25 points. Hakim Warrick added 23 and Josh Pace scored 12. Hakim Warrick scored a game-high 25 points. Hakim Warrick set a new career-high with 36 points. Gerry McNamara and Terrence Roberts added 14 points apiece. Hakim Warrick scored a career-high 35 points. Josh Pace added 12 for the Orange. Gerry McNamara scored 18 points and Josh Pace added 14. Louie McCroskey scored a career-high 18 points. Gerry McNamara scored 16. Hakim Warrick scored a career-high 32 points. Josh Pace added 21 points and Gerry McNamara scored 18. Hakim Warrick scored 16, Josh Pace added 14, and Terrence Roberts had 12. Gerry McNamara scored 22 points and Hakim Warrick added 20 for the Orange. Gerry McNamara scored 26 points and Hakim Warrick added 25. Gerry McNamara and Hakim Warrick scored 21 points apiece, while Josh Pace and Billy Edelin each added 14. Hakim Warrick scored 22 points and Gerry McNamara scored all of his 18 points in the second half. Hakim Warrick led the way with 25 points. Gerry McNamara added 17, Josh Pace scored 13, and Craig Forth chipped in 10. Hakim Warrick had 25 points. Josh Pace, Craig Forth, and Gerry McNamara scored 14, 11, and 10, respectively. Gerry McNamara scored 22 points to lead the Orange. Josh Pace added 16 and Hakim Warrick scored 12. Gerry McNamara scored 23 points, while Hakim Warrick and Craig Forth added 14 and 10 points, respectively. Hakim Warrick scored 22 points to lead the Orange. Gerry McNamara added 19, Josh Pace 12, and Louie McCroskey scored 11. Hakim Warrick scored 29 points and Terrence Roberts scored a career-high 20. Gerry McNamara added 17 points. Hakim Warrick scored 22 points and Demetris Nichols chipped in 10. Gerry McNamara just missed a triple-double with 19 points, 10 assists, and 9 rebounds. Josh Pace led the team with 22 points and Hakim Warrick added 19. Hakim Warrick scored 19 points and Josh Pace and Terrence Roberts added 16 points apiece. Hakim Warrick scored 21 points, Josh Pace added 14, and Darryl Watkins had career highs in points (14) and rebounds (13). 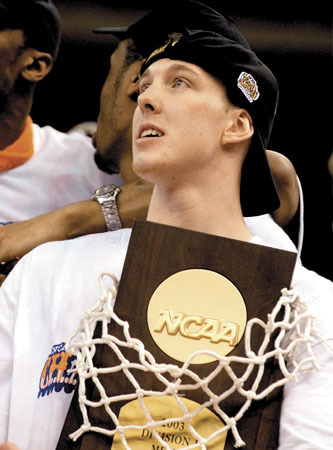 Hakim Warrick scored 20 points, Gerry McNamara 18, Louie McCroskey 11, and Billy Edelin 10 to lead the Orange. Josh Pace scored 20 points. Gerry McNamara added 18 and Hakim Warrick 13 for the Orange. Hakim Warrick scored 23 points, Terrence Roberts added 13, and Gerry McNamara and Josh Pace each scored 12 to lead the Orange. Gerry McNamara had a game-high 29 points to lead Syracuse over Siena. Josh Pace added 13 points, while Hakim Warrick scored 13 points and pulled down 15 rebounds. Hakim Warrick scored 25 points, and Gerry McNamara added 21 to lead Syracuse to the championship victory in the Coaches vs. Cancer Classic at Madison Square Garden. Hakim Warrick scored 21 points and pulled down 10 rebounds to lead Syracuse to victory in the semifinals of the Coaches Vs. Cancer Classic. Josh Pace added 12 points, 7 rebounds, and 5 assists, while Craig Forth chipped in 11 points and 8 rebounds. Gerry McNamara scored 9 and dished out 7 assists. Senior forward Hakim Warrick scored a game-high 20 points and had six rebounds to lead No. 6-ranked Syracuse (2-0) to a 56-45 victory against Princeton in the second round of the Coaches vs. Cancer Classic. Warrick was honored after the game as the TIAA-CREF Coaches vs. Cancer Regional MVP. Hakim Warrick had a double-double with 19 points and 10 rebounds to help the #6/6 Syracuse Orange defeat Northern Colorado, 104-54, in the first round of the Coaches vs. Cancer Classic. Four other Orange players scored in double figures with senior Josh Pace chipping in 13 points, sophomore forward Darryl Watkins having a career-high 12 points and junior Gerry McNamara and sophomore Demetris Nichols adding 11 points each. Come on, admit it. The thought of Syracuse getting back to the Final Four this year was about as likely as Carmelo Anthony returning to upstate New York for his sophomore season. Junior forward Hakim Warrick and sophomore guard Gerry McNamara represented Syracuse University on the All-BIG EAST men's basketball team announced on March 8. Warrick was a first-team selection while McNamara was named to the second squad. Gerry McNamara is the best clutch shooter in the country, according to ESPN's Jay Bilas. Junior Hakim Warrick and sophomore Gerry McNamara have been named two of the top 50 Preseason Candidates for the 2003-2004 Wooden Award All-America Team. See how Gerry's hometown newspaper followed the Orange during their National Championship season. Gerry McNamara, Syracuse's "other" freshman star, did all of his damage in the first half. Forward Carmelo Anthony and guard Gerry McNamara of the Syracuse Orangemen were unanimous selections to the Big East All-Rookie Team announced Monday. Syracuse freshman Gerry McNamara didn't get the same national attention as teammate Carmelo Anthony, but the rookie point guard still made the All-Frosh team.